It wasn't enough to gorge ourselves with turkey and all the trimmings Thursday and yesterday----today we have spent the day cooking! 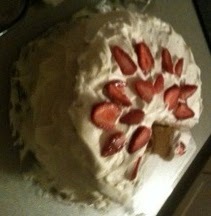 DIL---and #2 baked the scratch cake shown---with layers of strawberries and whipped cream---and yummy light cake. They used EVERY bowl in the kitchen---BUT OH SO WORTH THE MESS! Then #1 and I spent the day making Lulu's famous chili! He is becoming quite the cook! You should have seen his eyes when I taught him the measuring in the palm of your hand. After I gave him a demonstration, he couldn't wait to do the same trick. #2 (Mr. EXACT-O) said, "We have measuring spoons." I explained measuring spoons were for baking----COOKING was by the seat of your pants---OR the palm of your hand. We ate 1/2 a stock pot of chili---SO it MUST have been pretty good! LOVE cooking with my family!